A little while ago the folks at Business Foundations asked to sit down and have a chat with us about the WA game-making community. They were very interested in finding out if there was a way that they could help local developers with their businesses, with an intent to run a workshop specifically targeted towards the games environment in Perth. Zip forward to now, and Lachy at Business Foundations has just announced the details for the workshop! The workshop will be focused on business skills development, focused specifically for indie and freelancing game developers, and will feature guest speaker Scott Reismanis, founder of Desura and IndieDB. 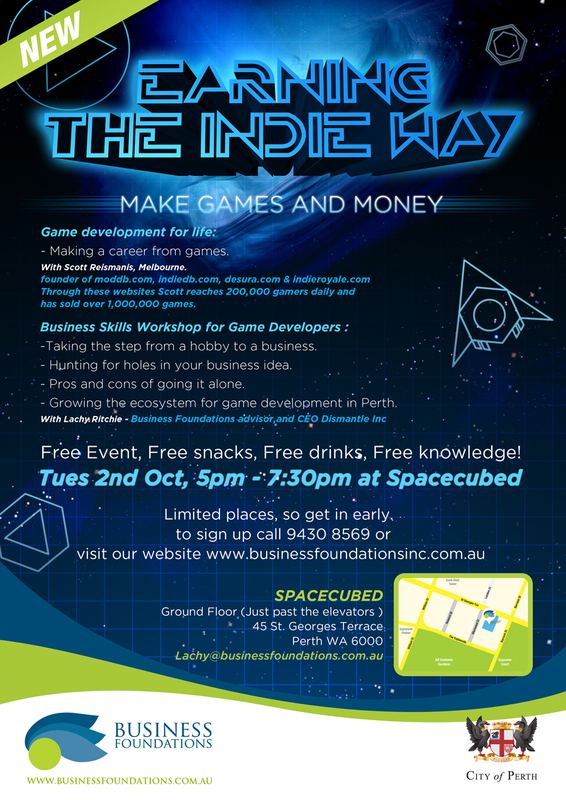 The workshop is being hosted by our friends over at Spacecubed, and best of all it’s free! Make sure to book your spot soon for this insightful workshop!